Jenn Hayman, Is the director of marketing for Zingerman’s Service Network, a shared service organization supporting the Zingerman’s Community of Businesses (ZCoB). Zingerman’s is a family of twelve businesses located in the Ann Arbor area. 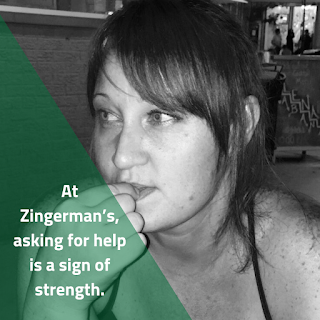 Jenn’s team of designers, illustrators, developers, writers and thing-makers provide the marketing and merchandising needs of the wide range of Zingerman’s businesses, from websites to retail environments and everything in between. Jenn was the keynote for the Center for Digital Engagement’s Digital Marketing Workshop in 2017, moderator of Accelerating the Sales Funnel, and CDE Summer Clinic Speaker Session. At this year’s Digital Marketing Workshop on November 16, Jenn will be a panelist for the session: Knowing Your Customer (room 310A from 9:10 to 10:30 AM). As a Marketing Professional, What Characteristics Do You Look for in a Candidate? Someone excited to share new ideas but knows that they don’t know everything already. As an intern or new employee, Jenn suggests being comfortable with grey areas, and motivated to grow and learn. Also, having “hustle” and a good sense of humor will not only help you get to where you want to go but will make sure you enjoy yourself on your way. How do you Suggest Interns Approach Others for Help and Ask Questions? How do you suggest interns go above and beyond to leave a lasting impression? Provide an end-of-the-internship summary of what you learned. This could include mistakes made or problems encountered and what you learned from them. List your achievements and new skills you have developed. Lastly, ask for feedback of your performance—this will not only show you value the work you did with your company but that you value your work. To Jenn, that shows that you are serious about advancing your future. What aspect of your personality has most helped you succeed? "I suppose there are aspects of my personality that resonate better with some than others. I think it goes both ways—you have to find somewhere that allows you to be your whole self, not just an edited version for the workplace (though slightly curated, perhaps!). I personally enjoy casual environments. Not just in attire, but in attitude. I want to know about my co-workers’ families and what they did last weekend, to be able to laugh together, and laugh at ourselves. So I guess it has served me well to be authentic and not sell myself as something I’m not, and I’ve chosen to stay with organizations that are suited to that." Personal Life: What are your favorite ways to spend downtime?